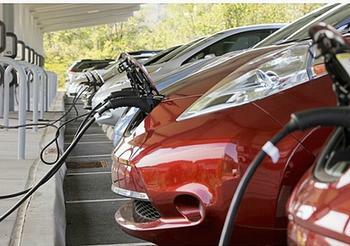 WASHINGTON, DC, July 27, 2016 (ENS) – The Obama Administration is unlocking up to US$4.5 billion in loan guarantees and inviting applications to support the commercial-scale deployment of innovative electric vehicle charging facilities, the White House announced on Friday. The loan guarantees are part of an unprecedented set of actions from the federal government, the private sector and states that creates a new collaborative framework for vehicle manufacturers, electric utilities, electric vehicle charging companies, and states to increase EV charging infrastructure. Forged by the White House with the Department of Energy (DOE), the Department of Transportation (DOT), the Air Force, the Army and the Environmental Protection Agency, the collaboration is focused on a set of “Guiding Principles to Promote Electric Vehicles and Charging Infrastructure” that nearly 50 organizations signed on Friday. The charging station manufacturer ChargePoint has committed up to $20 million toward the deployment of a national network of high-speed charging stations. The administration and partners pledged to work quickly to identify zero emission and alternative fuel corridors where EV charging stations, especially fast charging stations, can best be placed across the country. The partnership will address these questions to provide the necessary information for the basis of a dialogue with stakeholders to help define public-private partnerships, funding, and financing models for implementing a national fast charging network. Along those lines, the DOE and DOT will be convening stakeholders this fall to identify critical needs for a national network of fast charging stations. The partners say they want to leverage the power of data and host an Electric Vehicle Hackathon to gain insights and develop new solutions for electric vehicle charging. In addition, the administration is calling on state, county, and municipal governments to partner with the federal government to purchase electric vehicle fleets at a discount. 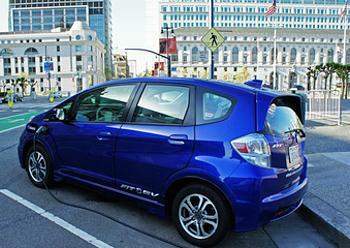 The federal government alone plans to purchase more than 500 plug-in hybrids or pure EVs in fiscal year 2017. The Obama Administration points to a record of progress to build on, pointing out that in the past eight years the number of plug-in electric vehicle models increased from one to more than 20, battery costs have decreased 70 percent, and the number of electric vehicle charging stations has increased from less than 500 in 2008 to more than 16,000 today – a 40-fold increase. To get municipalities involved, DOE’s Office of Energy Efficiency and Renewable Energy (EERE) plans to sign an agreement with the American Public Power Association (APPA) to collaborate on electrifying municipal fleets throughout the United States. EERE and APPA will provide information to increase awareness of the benefits of EVs to public power utilities and local officials, and develop a community action plan focused on smaller communities with fewer than 200,000 electricity customers. The partnership will strive to enhance workplace charging efforts at public power utilities, study the impacts of EVs in public power communities, and share insights regarding infrastructure installation and EV interaction with the modern grid. The Department of Energy will partner with industry, the national laboratories, and others to examine the vehicle, battery, infrastructure, and economic implications of direct current (DC) fast charging of up to 350 kW in a study to be completed by the end of the year. A 350 kW charging system could charge a 200 mile range battery in less than 10 minutes. A multi-partner team, led by the Pacific Northwest National Laboratory as part of the Battery500 research consortium and including Tesla, will receive an award of up to $10 million per year for five years to drive progress on DOE’s goal of reducing the cost of vehicle battery technologies, enabling smaller, lighter weight, less expensive battery packs (below $100/kWh) and more affordable EVs. Developers of multi-unit dwellings and commercial buildings will employ EV-Ready building practices, preparing buildings with electrical infrastructure to accommodate a future charging station installation. This is expected to result in cost savings for building owners and tenants. An EV-Ready building code measure has been introduced to the American Society of Heating, Refrigerating, and Air-Conditioning Engineers a standard for high performance green buildings that in 2018 will become the basis for the International Green Construction Code. DOE’s Workplace Charging Challenge encourages America’s employers to commit to providing EV charging access for their workforce. The Challenge has grown to more than 350 partners since its launch in January 2013, and is on track to meet its goal to partner with 500 U.S. employers by 2018. Thirty-five new partners were announced Friday, including the automaker Hyundai. Finally, the White House Office of Science and Technology Policy will host an EV Hackathon this fall to gather coders, data scientists, topic experts, and interested members of the public to discover insights and develop new solutions. Automakers are doing more than ever before to advance electric vehicle adoption. The BMW Group has committed to producing BMW iPerformance vehicles, or plug-in hybrid versions of all of its volume models. The first model, the BMW X5 xDrive40e, was released in fall 2015, and was followed this year by the 330e Sedan and the 740e xDrive Sedan. The BMW Group is committed to advancing battery technology through research partnerships, including with the DOE’s Argonne National Laboratory, and will continue to support DC fast charging infrastructure in the United States. BMW successfully launched ‘project i’ with the plug-in hybrid i8 and the all-electric i3 in 2014, and the inclusion of a plug-in hybrid version in all of its volume models. Ford is investing an additional $4.5 billion in electrified vehicle solutions, adding 13 new electrified vehicles to its product portfolio by 2020. More than 40 percent of Ford’s nameplates globally will be electrified by that year. General Motors will introduce a long-range, affordable EV later this year. 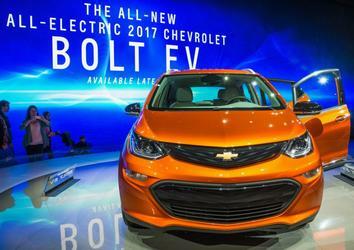 The Chevrolet Bolt EV will provide more than 200 miles of range on a full charge, be priced under $30,000 (net full federal tax credits) and will be produced at the GM assembly plant in Orion Township, Michigan. General Motors also will continue investing in battery technology and expertise, including at the largest battery lab of any automaker in North America. The company has installed over 500 workplace chargers at GM campuses around the United States. Mercedes Benz will have 10 plug-in hybrids available by next year. Nissan has sold more than 95,000 LEAF EVs in the United States, and has led the 10-fold increase in CHAdeMO fast chargers nationally since 2013. They can charge an all-electric LEAF up to 80 percent in 30 minutes. Now more than 1,840 fast chargers are available at retail, hospitality, fueling station, and dealership locations. Tesla will start volume deliveries of Model 3 in late 2017, which will have a range of at least 200 miles, meaning that affordable long range EVs will be available on the market sooner than analysts predicted. Tesla has already started operations at the $5 billion Gigafactory it is building outside Reno, Nevada, which will manufacture batteries, ensuring that EVs are powered by American-made, high-quality, and affordable batteries.